J-Bug (3) is never required to participate in school time. 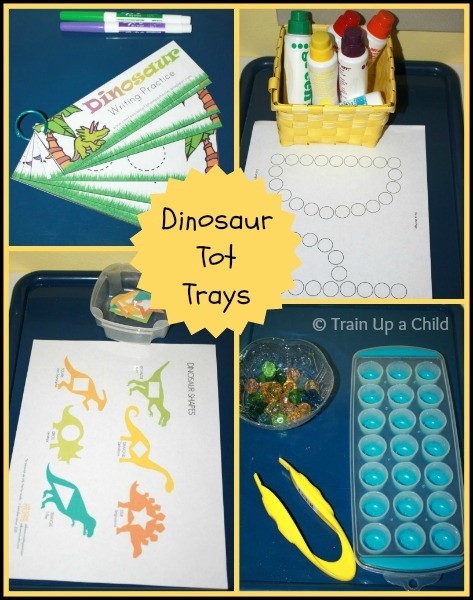 I set up these trays to give him something educational and fun to do while JZ (5) works. I would give him toys only, but he requests work. Like most younger siblings he is eager to keep up and be just like his big brother. Please note: I do not encourage pushing young children to do school work. 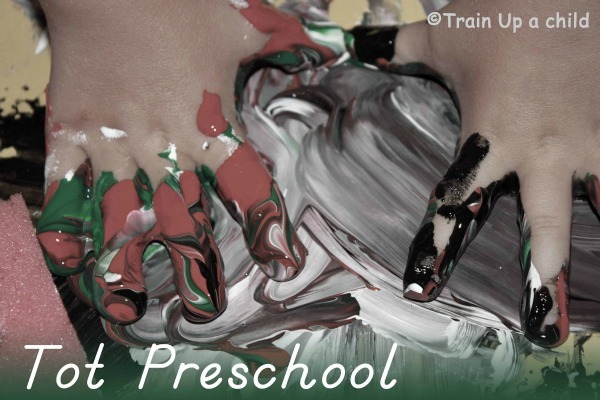 If you want to engage in educational activities with your young child remember that early learning is best accomplished through play and movement. I encourage you to follow your little one's cues and have fun! JZ's kindergarten Dd is for Dinosaur unit that corresponds with this week. Ice cube tray, tweezers and plastic gems for transferring and one to one correspondence. 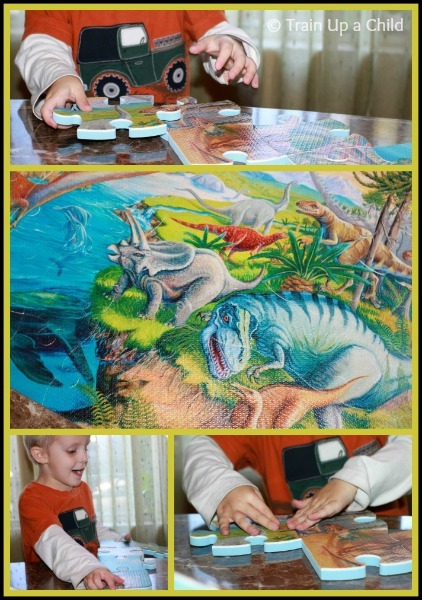 J-Bug and I put together his Dinosaur floor puzzle several times throughout the unit. He requires my help on this puzzle, because every piece is the same size and shape. They all fit together, so instead of trial and error, pieces need to be assembled completely based on the picture. 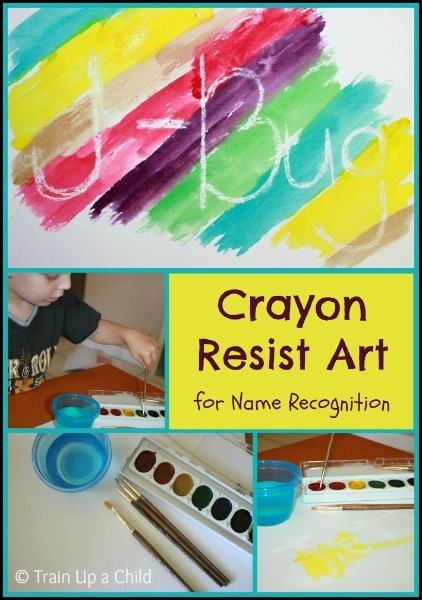 I used a white crayon to write his name on watercolor paper the night before, so J-Bug didn't know what was on it. During school time he used watercolors to paint, and as he covered the entire area he saw his name appear. He giggled the entire time and excitedly read off each letter as it appeared. Note: The photo below shows the second time we did this activity with his nickname. J-Bug's bulletin board above his trays was a bit sparse this week. It is a good example of the flexibility we have with his school work. Some weeks he joins us more than others. For more ideas for hands on learning follow me on Pinterest. Such fun ideas for learning. My son would love the dinosaurs! Love these ideas...and his smile is so sweet! I think my girls would love a dinosaur theme too! I love all your trays, as always. :) I love that you wrote with white crayon the night before so he thought he was just painting the white paper. I have to remember that idea. My oldest will love it! We love Dinosaurs too! Such fun. Thanks for sharing on Kids Get Crafty.